Heading out of town for the holidays? Or hosting out-of-state guests this holiday season? 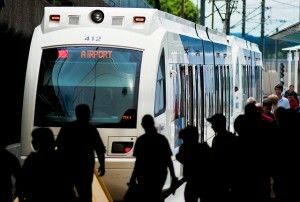 TriMet’s MAX Red Line provides direct service to and from the terminal at Portland International Airport (PDX). Red Line ridership has reached a new high. From September 2013 through August 2014, the Red Line’s 13th year in operation, more than 1.249 million trips were taken on the line, which runs between Beaverton Transit Center and PDX. Red Line ridership had last peaked at 1.2 million in 2008. 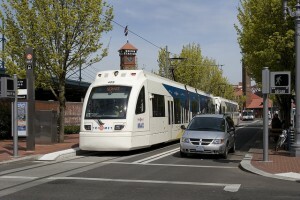 MAX Red Line was the first train-to-plane connection on the West Coast and continues to serve as a quick connection to bypass traffic. You can get from Portland City Center to PDX in just 38 minutes. Plus, it’s easy to roll your luggage on board. Just keep it in your possession and under your control. The line serves more than 20 stations between Beaverton and the airport, allowing for easy pick up or drop off of those coming from or going to the airport. Trains run about every 15 minutes most of the day. Plan a trip to the airport. Not going by air? You can also take transit to the train. MAX Green Line, MAX Yellow Line and various bus lines serve Amtrak’s Union Station and the Greyhound Bus Terminal. Plan a trip to Union Station or Greyhound. On Thursday, November 27, Thanksgiving Day, TriMet buses and MAX will operate on Sunday schedules. WES Commuter Rail will not be running and our customer service offices will be closed. Several bus lines do not have service on Sundays so be sure to check your line’s schedule plan your trip accordingly. Need tickets? We have an app for that! Our free TriMet Tickets mobile app lets you easily purchase and use tickets and passes instantly on your phone – anywhere, anytime. Just download the free app, register your debit/credit card in our secure system and you’re ready to buy, activate and go. Learn more at trimet.org/mobiletickets.